It pays to be the boss, in more ways than one. In addition to bigger paychecks, America’s bosses are more satisfied with their family life, jobs and overall financial situation than are non-managerial employees, according to a recent Pew Research Center survey. Top managers1 with children also are less likely than other working parents to say parenthood has been an obstacle to job advancement (33% vs. 17%) and more likely to say their current position is their career rather than a just a job to get them by. But the differences between labor and management virtually disappear when the subject turns to gender discrimination in the workplace. Bosses are no more likely than workers to say that society favors men over women (43% for bosses and 46% among workers). 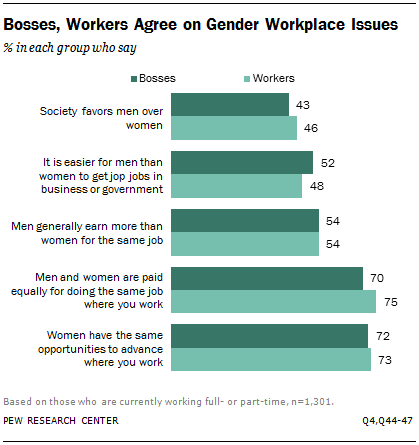 Similarly, only 4% of bosses and 9% of workers say women get preferential treatment while similar shares say both are treated equally (44% for bosses and 40% for workers). Bosses and workers also agree that the country needs to make more changes in order to bring gender equality to the workplace (62% and 66%). Turning to other realms of life, the survey found that bosses are more likely than workers to identify with the Republican Party while workers are more inclined to identify as Democrats. And when it comes to the weekend, top managers and workers are equally likely to be found in church or attending some other religious service. This attitudinal profile of bosses and workers emerges from a Pew Research survey of 2,002 adults conducted October 7 to 27. The sample included 1,301 men and women who are currently working full- or part-time. Margin of sampling error is plus or minus 3.3 percentage points for results based on all employed respondents, plus or minus 3.6 points for the subsample of 1,090 workers and 8.3 points for results based on the sample of 211 bosses; 14 employed respondents did not answer the question. All differences between workers and bosses reported in this analysis are statistically significant. The analysis is based on data from a larger Pew Research Center report on gender in the workplace, released December 11, 2013. The survey asked adults if they would like to someday be a boss or top manager. Among all employed adults, about four-in-ten (39%) say they would while a roughly similar share (43%) say they would not. The Pew Research survey found that adults who say they are the boss are more satisfied than workers with their home and work lives. Overall about eight-in-ten bosses (83%) describe themselves as “very satisfied” with their family situation. In contrast, about seven-in-ten (74%) of workers are similarly content with their home lives. A larger labor-management gap opens when the subject turns to jobs: 69% of bosses but 48% of workers report they are very satisfied with their current position. Bosses also are more satisfied than workers when they check their financial bottom line. Four-in-ten top managers say they are very satisfied with their financial situation. In contrast, 28% of workers have such a rosy view. That’s not surprising. According to the survey, about half of all bosses and top managers (54%) have household incomes of $75,000 or more, compared with only about a third (32%) of other employees. Not only do bosses earn more money, they are significantly more likely than workers to think of their job as a career (78% vs. 44%) and less likely to say it’s just a job to get them by (13% vs. 36%). 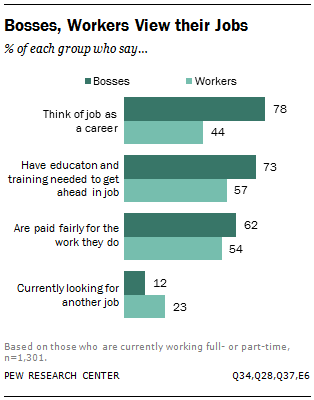 Bosses also are more likely to say they have sufficient education and training to help them succeed (73% vs. 57%) and to believe they are fairly paid for the work they do (62% vs. 54%). So it may not be surprising that bosses are only about half as likely as workers to be looking for another job (12% vs. 23%). In part, each of these differences is attributable to age. On average, bosses are about eight years older than workers (47 vs. 39) so as a group they are further along in their careers. Top managers and non-management employees say they value the same things in a job. At the top of their lists: Work they enjoy doing (39% for bosses and 44% for workers say this is “extremely important” to them). Followed by job security (32% and 36%), and the ability to take time off for child or family care needs (32% vs. 35%). Both groups also agree what is less important about a j0b. Only about one-in-five bosses (20%) and workers (18%) say a big salary is extremely important while somewhat similar proportions highly value a job that helps society (19% and 23%) and opportunities for advancement (25% and 24%). On only one of the seven job values tested in the survey did workers and bosses differ. Roughly a third of workers (35%) but about a quarter of top managers (26%) say having a job that offers good benefits was “extremely important” to them. In terms of their politics, bosses are more likely to identify with the Republican Party while workers favor the Democrats. According to the poll, about half (53%) of bosses say they are Republican or lean to the GOP compared with 37% of workers. In contrast, 44% of workers but 34% of bosses identify with the Democratic Party. About four-in-ten bosses (43%) and 37% of workers describe themselves as political conservatives while about a third (34% and 33%, respectively) say they are moderates. Only 17% of bosses and 21% of workers describe themselves as liberals. Bosses also are no more likely than other workers to be atheists or agnostics (5% and 6%) or to describe their religious affiliation as “nothing in particular” (18% and 19%). Roughly similar proportions also attend religious services at least once a week (33% for bosses and 36% for other workers). To a striking degree, bosses and workers share similar views on key gender issues in the workplace. About half of top managers (52%) and employees (48%) say it’s easier for a man than a woman to get a top job in government or business. And exactly the same proportion say men generally earn more for doing the same work (54% for both sexes). But both labor and management offer a more positive view when asked to focus on how men and women fare at their workplaces. Seven-in-ten bosses and a similar share of workers (75%) say that men and women are paid the same for doing the same job where they work. Equally large majorities agree that women and men have the same opportunities to advance. Whites still dominate in the corporate suite: 16% of all whites are bosses, compared with 6% of blacks and 4% of Hispanics, the survey found. And perhaps predictably, the Millennial generation, recently arrived in the workforce with an abundance of ambition, will have to wait a few more years to break into the executive suite. Only 4% of Millennials say they are bosses, compared with 16% of Gen Xers and 17% of Baby Boomers. Today’s bosses also are somewhat better educated than other adults. According to the survey, those with college degrees (16%) or some college experience (15%) are most likely to say they are now a boss or top manager. In contrast, only 8% of all high school graduates and those with less education have a top job where they work.